Since the murderous attack on the editors of the satirical magazine Charlie Hebdo in Paris (January 2015), the discussion about the cartoons of the Prophet Muhammad has witnessed a revival. In the Western world they are protected by the right to freedom of expression. A religion cannot be insulted, it is argued, and in many Western countries believers who feel antagonised are not protected by the Law. In the Islamic world, insulting Islam and other religions is a punishable offence. The defamation of Islam and its Prophet is a deeply rooted tradition in the Christian and Western world. As early as the twelfth century, books were written in which Muhammad was described and depicted as a fraud or as an epileptic who abused his fits to make people believe that he was receiving revelations from God. After the Reformation in Europe the same negative qualities were effortlessly ascribed to the Pope in Rome. Both the Pope and Muhammad – or the sultan of the Ottoman Empire as the case required – were portrayed as the antichrist. 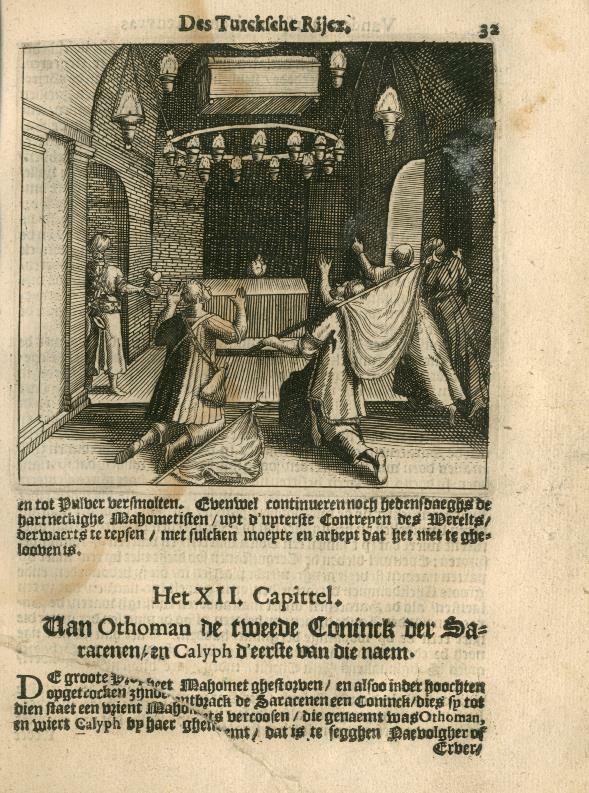 In 1627 an anonymous book was published in Amsterdam which recycled all the slanderous myths about Muhammad in a handy format: Historie van den Oorsprongck, Geslacht, Geboorte, Opvoedinge, en Leere des grooten valschen Propheets Mahomets (‘History of the Origin, Descent, Birth, Education and Teachings of the Great False Prophet Muhammad’). It is part of the collection of the Society of Netherlands Literature (shelfmark 1144 A 46). Remarkably, all stories are provided with an engraved illustration. We will spare you the defamatory pictures of the Prophet, but one illustration shows the grave of Muhammad in Mecca (!). Before his death, so the story goes, Muhammad concealed strong magnets in the dome of a ‘church’ in Mecca. He also ordered a metal coffin for himself. When after his demise his coffin was carried inside the church, it rose to the ceiling and remained afloat in the air: a miracle!